how to cook basmati rice in a pot or pan with perfect fluffy and separate grains. 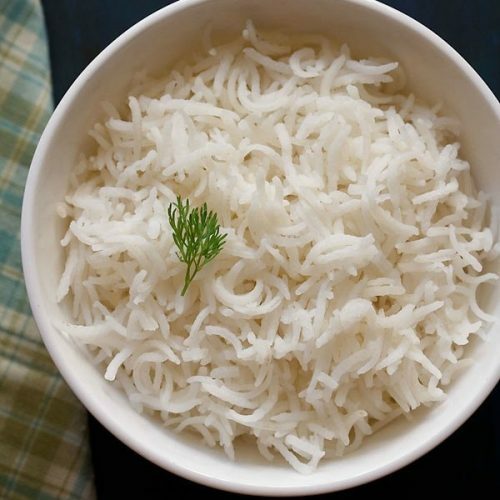 take 1 cup heaped basmati rice in a bowl. begin to rinse the rice grains in running water. rinse the rice with a gentle swirling of your fingers in the bowl. the rice has to be rinsed till the water becomes clear, transparent and without starch. then soak the rice in 3/4 to 1 cup water for 30 minutes. after 30 minutes, strain the rice very well and keep aside. in a deep bottomed pan, add 2 cups water (500 ml). use a wide deep pan so that the water does not spill out while cooking. add 1/2 tsp oil. you can also use butter or ghee. this step is optional and you can just skip it too. also add 1/4 tsp salt or as per your taste. on a medium flame, let the water come to a boil. then add the rice. once all the rice grains are added, you can gently shake the pan, so that the rice grains settle down. or alternatively, you can also give a gentle stir with a fork. cover the pan with its lid. if the grains do not look cooked and the water has got over, then add 2 to 3 tbsp of hot water. stir gently with a fork. lower the flame and cook the rice till done and all the water has been absorbed. it took me 8 minutes for the rice to be tender, soft and fluffy. you can check once or twice while the rice is cooking. to check the doneness, press a cooked rice grain with your thumb and forefinger. it should be soft and mash easily. or you can bite into a few rice grains. it there is resistance in the bite, this means the grains need to be cooked for some more time. allow a standing time of 5 minutes, before you open the lid. then gently fluff the rice with a fork. serve these perfectly cooked rice grains with your favorite curry or dal.